Two legends in the making. James Glickenhaus' P4/5 and the P4/5 Competizione. They are together for the first time, in Glickenhaus' immaculate New York garage. 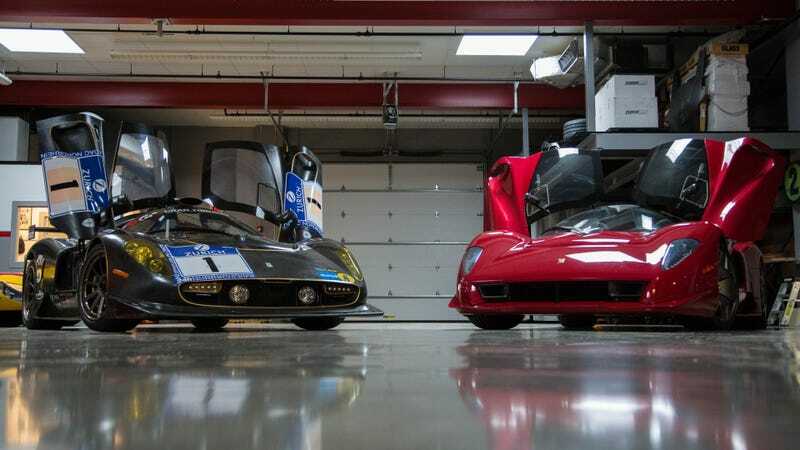 Scuderia Glickenhaus posted 99 outstanding photos of this union right here, showing the Ferrari 430 Scuderia-based P4/5 getting unboxed and meeting its sister, the Enzo-based P4/5 for the first time. As a brief refresher, the original P4/5 is what happens when a gearhead who loves the classic Italian race cars of the '50s and '60s gets together with Pininfarina to build the absolutely ultimate retro supercar. It is lighter, more aerodynamic, and a whole lot more classically beautiful than the Enzo with which it shares its architecture. The P4/5 Competizione is Scuderia Glickenhaus' competition car. It's the fastest Ferrari to ever lap the Nürburgring, having raced at the Green Hell for 24 hours. The whole thing harks back to the days of privateer 'specials' and gentlemen racers in the very best way. And here they are in Glick's garage. You don't need me to tell you to enjoy these pictures. Just try not to drool too much.